Looking for easy snacks recipes? * For the dip, place the tomatoes in a bowl. * Crush and then chop the garlic, add to the tomatoes. * Finely chop the basil sprig and add to tomatoes to the rest of the ingredients. Refrigerate for a while. * Prepare dough with the above ingredients. * Give it a rest for 10 minutes. Now roll out a very thin sheet and bake it in a pre-heated oven at 200c for 10-12 minutes. * Remove and break into pieces. Serve with the almond dip. * Blanch the almonds, make a puree and keep it aside. * In a pan, heat a little oil, add ginger and green apple dices with a little water to boil. Cool it down to make a puree. * In a separate sauce pan, add a little refined oil, shahijeera, saunf and cinnamon and sauté well. * Add almond puree to cook for some time then add apple puree. * After that, add a good vegetable stock and cook for 20 minutes. Add honey, pepper and jeera powder to it. * Check the seasoning. Finish with cream and almond flakes which are toasted. * Boil white pea till it's cooked well. * Mix chopped onions, chopped tomatoes, green chillies, fresh coriander, lemon juice, red chilli powder and chaat masala. Adjust the seasoning. * In a separate bowl, take almonds, pomegranate pearls and sweet potato. * Drizzle with saunth chutney, lemon juice, chaat masala and chopped coriander. Toss it lightly. 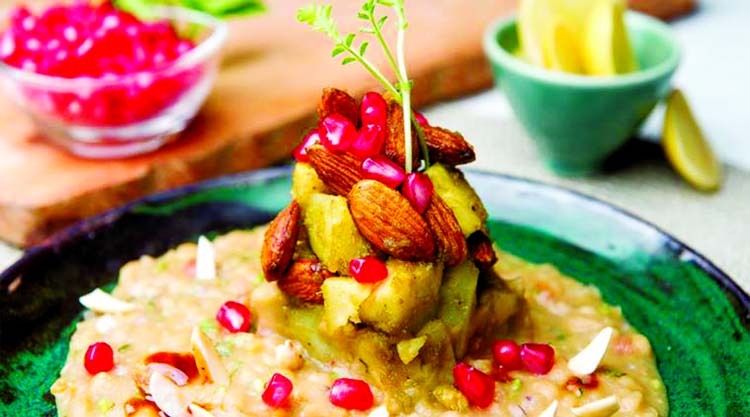 * Then, on a serving plate, mould the white pea ragda and arrange the almond chaat on top of it. Serve garnished with a coriander sprig.